Western media focuses on the lifting of sanctions on Belarus by the West, Belarus’s rejection of plans for a Russian air base and heralds the thawing of relations with the West. In other news: Belarusian journalist convicted for the “illegal dissemination of media products" and market traders protest controversial new imports rules. All this and more in the newest edition of the Western Press Digest. Belarus is struggling to normalise relations with the West with weak resistance against Russian dependency, despite economic and political gridlock – Valiery Kavaleŭski, writing for Forbes, suggests that now, in Lukashenka’s fifth consecutive term, “Belarus is trying to normalise relations with the West without angering Russia” and points to three events in particular which demonstrate this stance taken by the government. The "new chilliness" in relations between Moscow and Minsk which is causing a "relative thaw" between "Belarus and the West" – Brian Whitmore, writing for Radio Free Liberty/Radio Liberty, comments on the similarities between how “Kazan and Minsk have been defying the Kremlin with stunning regularity — and getting away with it.” Whitmore points at Lukashenka’s refusal to recognise Crimea as part of Russia and his “neutral stance” on the conflict in the Donbas and Moscow's conflict with Turkey as evidence of this. Jury Drakachrust of RFE/RL's Belarus Service commented on Putin’s talk of the "closeness" of Minsk's and Moscow's positions on Ukraine and Syria by saying that, "in the language of diplomacy, phrases like 'the closeness of our positions' is common for countries Russia is friendly with, but not for its closest allies." However, Whitmore stresses, this does not mean that Belarus, “which receives significant subsidies from Moscow”, is “going to burn its bridges with Russia” entirely. Western sanctions on Belarus lifted due to "strategic concerns" – Edward Wrong, writing for Global Risk Insights, claims that the temporary sanctions suspension for Belarus is due to “strategic concerns” overcoming “humanitarian ones” in spite of the OSCE’s concerns over the October presidential election. The article claims that the easing of sanctions is due to Belarus being crucial to current NATO-Russia tensions over the “Suwalki Gap” as it “is the only thing separating Belarus from the Russian enclave of Kaliningrad on the Baltic Sea” and Belarus’s recent apparent rejection of the proposed Russian air base in southern Belarus. 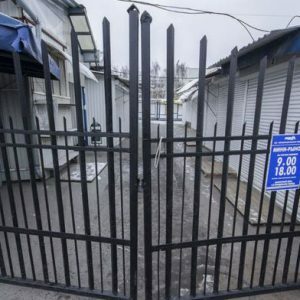 Shops shut down by market traders in protest against controversial new protectionism rules – The BBC reports on the shutting down of shops by market traders in Belarus in response to new rules stipulating that ”traders who want to sell the imported goods – which mainly come from Russia – must present proof of origin” under threat of fines. The article claims that the trade ministry acknowledged that at “least 68% of outlets” were shut down due to this attempt “to help the struggling state sector” despite market trader complaints that local goods are of poor quality and prices charged by state-run wholesalers too high. Conviction and fining of Belarusian journalist for "illegal" reporting – The Huffington Post reports on the fining of Belarusian journalist Larysa Ščhyrakova “for freelancing for an exiled television channel under a new restrictive media law.” She was found guilty of the "illegal dissemination of media products" by a Belarusian court and was fined $250. The court said Ščhyrakova​ "illegally interviewed" residents of a Belarusian village for Belsat, a channel that broadcasts from Poland and which has been denied media accreditation in Belarus for nine years. The article also mentions that in 2015, 28 journalists in Belarus were “hit with hefty fines” for similar crimes. Chernobyl child victims spend Christmas and New Year with their "Irish families" – Elaine Edwards, writing for The Irish Times reports on the arrival of 31 young children with special needs from their Irish-run orphanage in the remote village of Viasnova, 175km from Chernobyl, to spend Christmas and New Year 2015 with their “Irish families”, part of an annual programme where Belarusian children come to Ireland for rest and recuperation holidays. The orphanage was discovered by Irish volunteers from the Adi Roche Chernobyl Children International charity in the early 1990s and, since then, “€2.5 million of funding from Irish donations had been put into the orphanage, transforming it into a “world class” childcare centre,” according to the charity’s voluntary chief executive Ms Roche. Belarus Free Theatre's stand "against censorship and dictatorship" in London part of major theatre news highlights of 2015 – Nick Adwe, in his international 2015 “year in review” for The Stage, refers to the work of the Belarus Free Theatre as taking a “stand against censorship and dictatorship” at their base in London at the Young Vic and chooses it as one of the theatre highlights of 2015. Unveiling of a Polish photojournalist's project focusing on the victims of Chernobyl in Belarus – The BBC reports on the Invisible People of Belarus project of Polish photojournalist Jadwiga Brontē. On 22 January, President Alexander Lukashenka approved changes to Belarus' military doctrine. 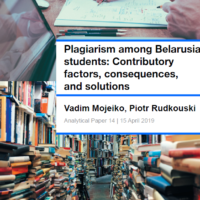 This document reveals fundamental changes in the mindset of the Belarusian establishment. Learning Ukrainian lessons, Minsk is putting issues of military security at the top of its priority list. Belarusian strategists have also identified which threats are to be countered. 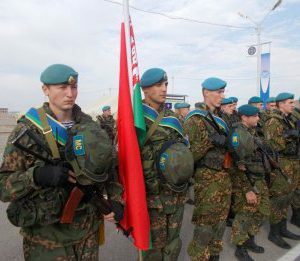 They include violent political changes, which Minsk suspects may come from Ukraine and pro-Moscow forces' attempts to repeat in Belarus their exploits in Ukraine. Minsk is also reevaluating its alliance with Russia. The Kremlin for years ignored Minsk's interests and is embarking on an increasingly chauvinist path. Last week, Russian President Vladimir Putin criticised Soviet-era international borders as 'arbitrary', implying that they could be changed through a Crimea- or Donbas-like scenario. On 22 January, Lukashenka approved changes to Belarus' military doctrine, which had remained unchanged since 2001. Identifying the potential military threats, the new edition of the doctrine points to 'hybrid warfare' and 'colour revolutions', clear terms if taken in the Belarusian and regional context. 'Hybrid warfare' refers to possible Russian interventions like those that occurred in Ukraine. Colour revolution means the West, interpreted IHS Jane's Defence Weekly. But that is a moot point. Minsk indeed harbours suspicions that somebody in the West might be working on toppling Lukashenka, but in recent years Belarusian officials have more frequently named Ukraine as a source of destabilisation in Belarus. For instance, just before the recent October 2015 presidential election a Belarusian government-affiliated TV channel reported about "200 armed Ukrainians" being detained at the border. Although Lukashenka cites the collapse of the state in Libya, Syria and Yemen as examples of possible scenarios that he wants to prevent, Minsk reviewed its military doctrine only after the crisis and conflict in Ukraine developed. In parallel, it started – however reluctantly – to construct a border with Ukraine. The official Belarusian parlance sends signals warning to extremist elements in Russia not to try in Belarus anything like they did in Ukraine. Raukou was merely further developing earlier statements made by Lukashenka who has many times publicly rebuked the Ukrainian government for “giving up its lands [in Crimea]” and neglecting the Ukrainian army which as a result failed to defend the country. Belarus remains an ally of Russia but Minsk regards this status less and less only as an asset, and hence is trying to reformulate the alliance. The Belarusian leadership sees a danger of the country being enmeshed in somebody else's war as a result of confrontation between Russia and other countries. The very first reason for Minsk to review the conditions of its alliance with Russia has to do with Moscow itself. The Kremlin frequently refuses to deal with Belarus as an ally and does not hide it. To take only the most known example, Moscow concealed from Minsk the early stages of the Russian operation to annex Crimea. Despite all lamentation about NATO expansion, Russia provides only minimal support for the Belarusian army that is sorely in need of equipment. This concerns even the most critical sphere for Russia – air defence. The Kremlin after many years of delays gave Belarus second-hand decommissioned S-300 surface-to-air missile (SAM) systems of the oldest possible model. While Moscow is about to supply Iran with the S-300PMU, a model from the 1990s, Minsk receives from Moscow S-300PS, a model from the early 1980s. Likewise, while proclaiming ever closer military cooperation, Russia attempted to give Belarus only the export models of another SAM system, the Tor-M2E. That means limited – in comparison to the models supplied to Russian army – capacities. Belarus received Tors also only after Moscow forced Minsk to give in on the issue of a Russian airbase. Other cases also show a hardly ally-like attitude. Many Russian analysts acknowledge that the Belarusian army provides the bulk of force protecting Moscow from the west. Both in the air and on land, Moscow for many years has refused to give Belarusians newer aircraft. The Belarusian army has only a few old fighter jets and no bombers, and plans to decommission its remaining battlefield close-support aircraft. This has rendered the Belarusian air defence system porous and ground forces useless without air support. The current economic situation in Belarus in comparison with 2010 has considerably worsened, with inflation reaching about 12 per cent in 2015. However, Lukashenka today insists that “if the last rouble remains in the state budget, we shall spend it on the security of our people.” To underline his point he again cited the situation in Ukraine, implying that insufficient care for security allowed that country to become a toy for more powerful forces. The Belarusian government seems to be taking the matter seriously. Despite economic hardships, it has found resources for projects that should result in military or dual-use products – like designing and manufacturing the multiple rocket launch system SAM and possibly other weapons with Chinese and probably Ukrainian firms. It has also invested in the overhaul of old Belarusian fighter jets, putting national security interests over economic calculations. While only a few experts have noticed these technical paraphernalia, adoption of an effectively new military doctrine has attracted much more attention. The doctrine, however, is only one small, visible example of fundamental changes triggered in Belarusian foreign and security policy by Putin's policies in the post-Soviet space. Minsk cannot cope with all the new risks without cooperating with other nations in the region and beyond. But it does what it can.